that you'll actually get to use. Get your set and start gardening with joyful ease. through planting to harvesting over and over again. - The apron has a zippered pocket that's great for holding a cellphone. - Comes with 5 deep pockets at the bottom for quick tool access. - Adjustable buckle strap allows for a great fit for men and women. - Both the apron and pads come in dirt-masking colors. - The set makes a great gift for gardening lovers.
. Click 'Add to Cart' now to make gardening easier completely risk-free! - DURABILITY YOU'LL LOVE: Flex your green thumb with a gardening apron that's designed to last. While others easily tear and quickly get dirty, we've made ours using waterproof, wear-resistant fabric that comes in dirt-masking brown. This means enhanced durability and less cleaning. - GARDEN IN COMFORT: No more knee pain as you garden away. Our garden apron for women and men comes with a pair of comfy foam kneeling pads. The soft garden kneeling pads take the pressure off your knees to make digging, planting, pruning, or harvesting a pain-free affair. - MORE POCKETS; MORE UTILITY: Hold and access your gardening tools the easy way. 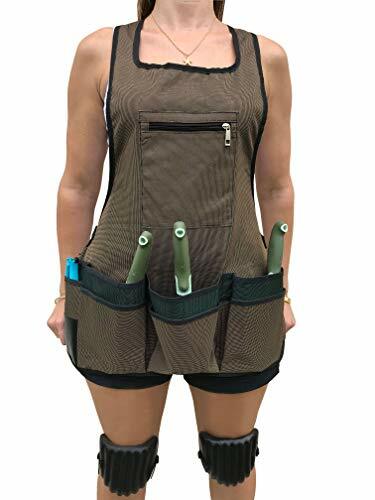 This heavy-duty gardener's apron not only comes with 6 pockets, but we've made them deeper than most to hold all kinds of tools. There's even a zippered pocket up top for conveniently holding your cellphone. - GREAT GARDENING GIFT: Looking for a thoughtful present for that gardening lover? This garden apron set makes a memorable treat. Perfect for crowning that birthday, holiday, or anything in between, it combines practicality with a whole lot of thoughtfulness. - 100% MONEY-BACK GUARANTEE: At Typhon East, we believe in old-fashioned service and quality. If you are dissatisfied with your work apron or yard kneeling pads, please reach out to us and we'll issue a full refund. Click 'Add to Cart' now to take your gardening to the next level risk-free!